While many sports fans may be tuning into Monday Night Football rather than the first Hillary Clinton-Donald Trump presidential debate Monday, the Clinton campaign’s still trying to reach them. That stereotype will certainly be familiar to many who regularly play fantasy football, and this seems like a reasonably effective way to try and get some of Clinton’s criticisms of Trump on the mind of a sports-savvy audience. It’s interesting to see such heavily-political ads on ESPN, though. Presumably they’re willing to take either side’s money, but display ads in particular can feel more permanent than video ones thanks to screenshots like this. 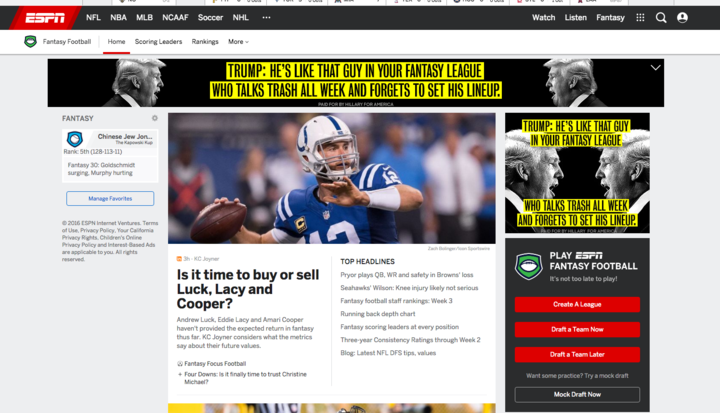 Seeing this when they log in to check their fantasy football lineup certainly won’t help ease the concerns conservatives have raised about the network’s supposed left-leaning slant, either, and it may be another annoyance for those who want the network to just #sticktosports. Sticking to sports is getting harder and harder in this election, though, given how sports keep coming up in it. It seems unlikely this will be the last example of sports being used as a political battleground.